IN HIS LATEST FILM, he’s described as a one-man army and he told www.asiancultureuvulture.com what he had to do to get in shape for it. 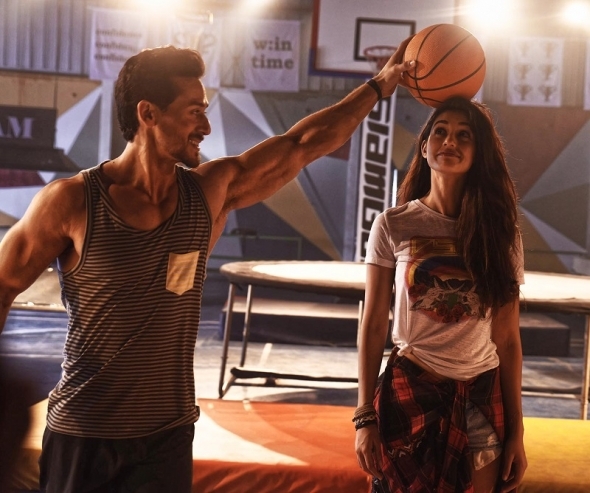 But beyond the kickass chutzpah he showed in his smash hit, ‘Baaghi’, Tiger Shroff is back in a big way with this film which releases today (March 30) and could well be Bollywood’s latest super franchise. Teaming up with the same director, Ahmed Khan, and playing the same character (‘Ronny’), he’s paired alongside the ravishing Disha Patani (pictured above with Shroff), who made quite the splash with her part in the MS Dhoni biopic; the two have been linked romantically by the Indian media and Shroff is very warm about his co-star on the phone from Mumbai to London with us. Despite appearances from the trailer – a staggering 55 million views on Youtube (and somewhat double the average for a reasonably prominent Bollywood release) – Shroff asserts there’s a love story at the heart of the film. Much of the conjecture about their potential romance has been driven by the chemistry the two display(ed) for publicity events for the film and some more social engagements captured on camera. While we can’t see Shroff, it’s clear he is smiling and warming to his theme. “There’s a lot of speculation,” he tittered, “and a lot of curiosity – that curiosity is definitely going to help us. People are very curious,” he went on. ‘Baaghi 1’ proved a big success and won a legion of fans – but this second instalment does not really pick up where the last one left off, he explained. But don’t let that completely fool you – some of the moves from the first instalment are revisited and some, he revealed. “We have upped the ante, ‘Baaghi 1’ was in a more controlled environment, with this we are out in the wild. The ‘one-man army’, as he has been referred to, had to bulk up for the part. “I had to prepare myself physically for the martial art action scenes, I had to have a heavier body and put on weight. He kept up the regime for around five months – and said he has now lost that weight. He has put his heart and soul into this – and it’s one of the reasons for his popularity; as on the phone, he has a degree of sincerity and application that isn’t always universally displayed in commercial Hindi cinema. He felt his skill as an actor has also been tested in ‘Baaghi 2’. He’s been identified as a Bollywood superstar in the making, and appears to connect with a lot of young people – of both sexes – even if for slightly different reasons. “I honestly don’t know,” he said, responding to the question about his popularity and connecting with young people. “Maybe it’s the way people perceive me, the way I dance and certain stunts that I do,” he added. He seems genuinely humbled and awed by the way the public have taken to him. While he isn’t eating quite so much, these days (and with reason, he explains) he is still in the gym and working out. He is keen on looking the part for his next film which is ‘Student of the Year 2’ – which first time around helped Siddharth Malhotra, Varun Dhawan and Alia Bhatt really break their way into Bollywood. All of them now are regarded as stars and leading the charge for the next generation of talent in the industry. “I’ve got to have that college boy look, not exactly a one-many army,” Shroff joked. That’s for the future and is slated for release in November this year. Right now, ‘Baaghi 2’ is doing all the talking, fighting and the dancing for him. “It’s definitely a strong story, an emotional story – there are a lot of twists and turns.